Sealing Tape – Tape Solutions, Inc. It also comes in a few different materials. Also, generally speaking, while certainly available as a clear adhesive, it can also often be found at most supermarkets in many different colors and patterns. If a particular color is not available in person, a customer is sure to find it online. There are several types of sealing tapes, such as thread seal tape, box sealing tape and carton sealing tape. Thread seal tape, also known as PTFE tape or plumber’s tape, is a polytetrafluoroethylene (PTFE) film used for sealing pipe threads. 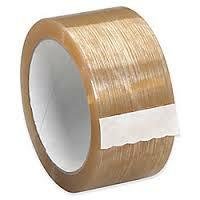 This type of sealing tape is sold wound on a spool and cut to specific widths for ease of use. It is commonly called Teflon tape, although this is technically incorrect. It is simply a pressure-sensitive adhesive coated onto a backing material. This adhesive is usually polypropylene or polyester film that is orientated to maintain strength in both the long direction and the cross direction. Box sealing tape is most frequently 48 millimeters (two inches) wide, but it is also sold in 72 millimeter (approximately 3 inch) widths. It is most commonly sold as clear adhesive or in beige, buff, brown or tan colors. Carton sealing tape may be applied with a handheld dispenser or an automatic tape dispenser. The tape may either be an acrylic adhesive or a hot melt adhesive. Both types of adhesive have positive attributes. For example, acrylic adhesive sticks to virtually any surface. Hot melt adhesive sticks instantly and won’t peel, crack or dry out. While they both have several versions with a range of tensile strengths, hot melt adhesives do ultimately have the highest tensile strength capabilities of the two. 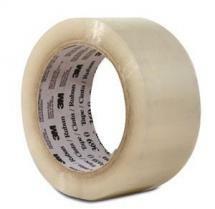 Sealing Tape Sealing tape is adhesive specifically designed to ensure a strong bond when closing or sealing an item. Sealing tape comes in a variety of lengths, widths, strengths and styles.